Sometimes it is necessary to convert a CMYK color space stored in DeviceN to DeviceCMYK. Some output devices treat DeviceN color spaces as special colors - even when they simply use CMYK in practice. In order to avoid an unwanted color conversion, it is therefore advisable to convert the CMYK channels stored in DeviceN to a simple DeviceCMYK format. 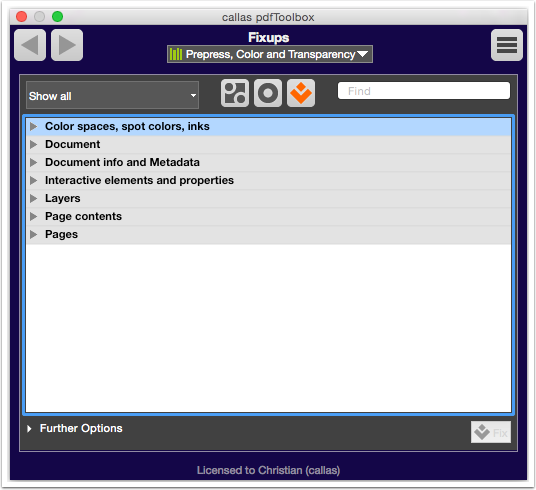 Create a new Fixup in the “Fixups” category inside the profile window. To do so, select “Create Fixup...” in the Options menu. 1) First, give the Fixup its own name, e.g. “DeviceN CMYK to DeviceCMYK”. 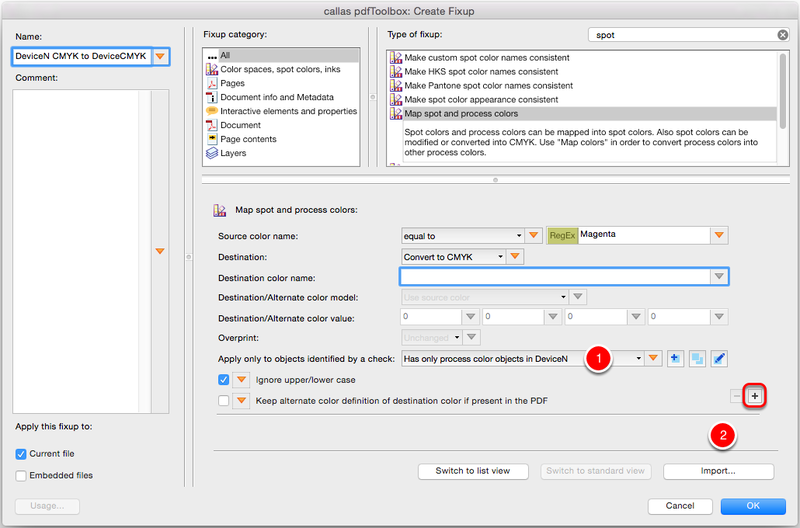 2) Next, find the Fixup type “Map spot and process colors”. 4) Select “Convert to CMYK”. 5) To limit conversion to objects that use CMYK, you will need to create a new Check. Click on the highlighted icon to do so. 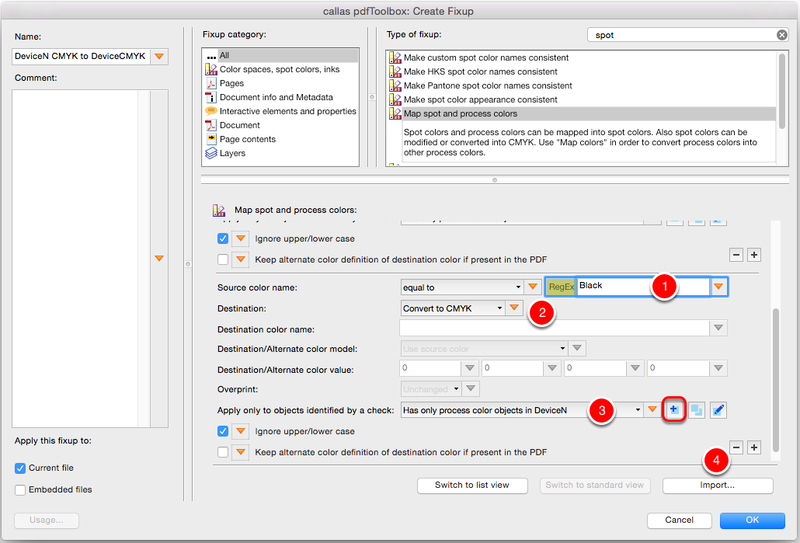 1) Give the Check a suitable name, such as “Has only process color objects in DeviceN”. 2) Search for “Has process colors as DeviceN” in the list of available properties in the upper right, then click “Add” and select “is true”. 3) Search again in the list of available properties, this time for “Object uses CMYK only (no spot colors)”, click “Add” and select “is true”. 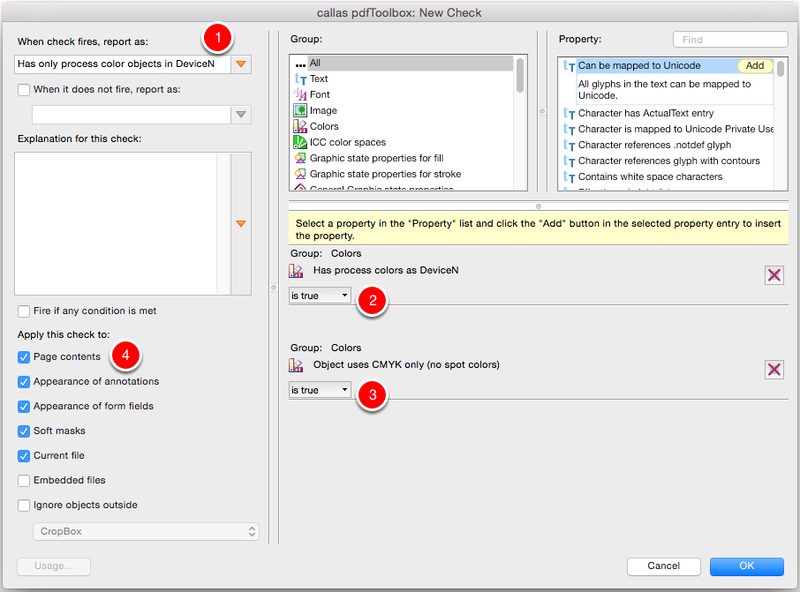 4) Make sure that the same object types are enabled. Click “OK” to save these settings. 1) The newly created Fixup should now be selected. 2) To add further conversion types to also cover cyan, yellow and black, click on the “+” symbol. A new area for additional conversion settings will be shown. 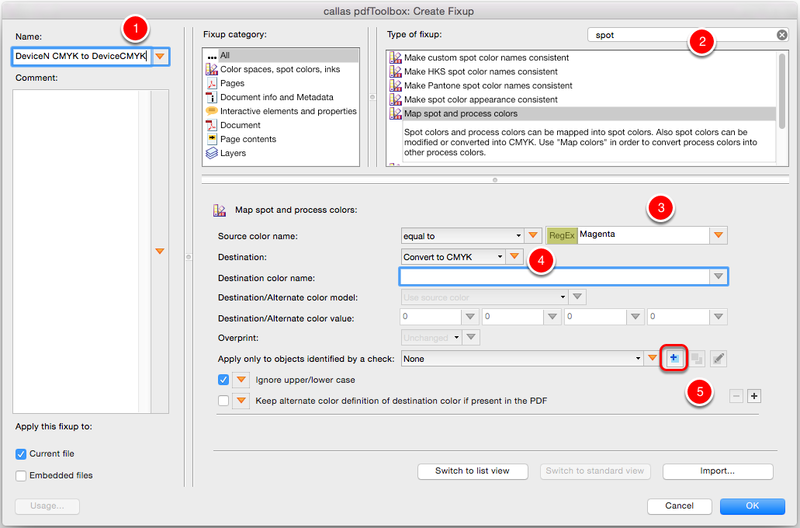 1) Enter the color name, e.g. “Black”. 2) Select “Convert to CMYK”. 3) Select the newly created Fixup. 4) Repeat with similar settings for cyan and yellow. 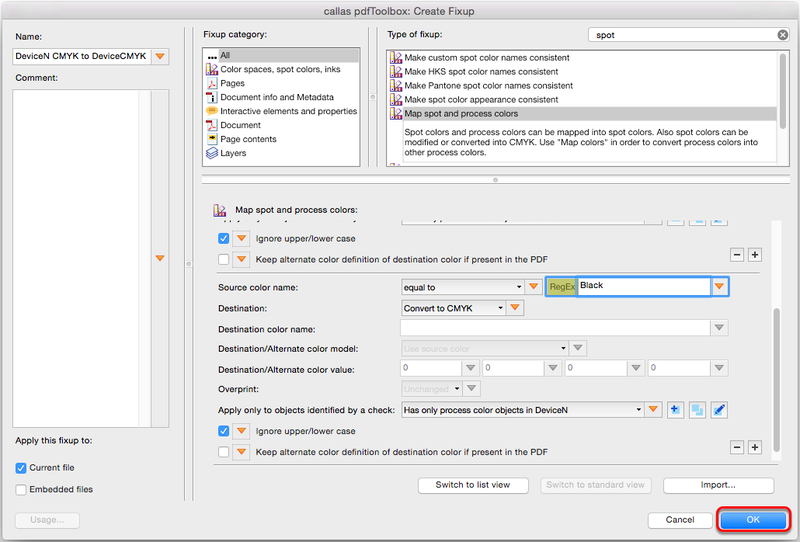 After providing the settings for all 4 color values, save the new Fixup by clicking “OK”. The new Fixup can now be used in any of the following ways: as an independent Fixup, within a Profile, or as part of a Process Plan.